Answer: Unfortunately, we do not currently carry any stainless steel mounting brackets. 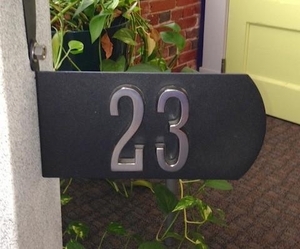 Answer: The post shown is granite and unfortunately it is not offered by the manufacturer of the mailbox. Question: Does the Spira Stainless Steel Unique Wall Mount Mailbox come with keys? Answer: Yes, the Spira Stainless Steel Unique Wall Mount Mailbox comes with keys. Thank you. 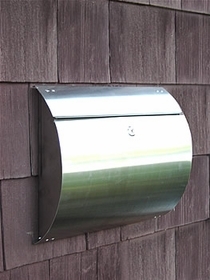 Question: Can the Spira Stainless Steel Unique Wall Mount Mailbox front be opened and closed without using the key lock? Answer: The key is required to open the Spira wall mount; however, you could remove the lock mechanism and replace it with a thumb latch from a local hardware store. 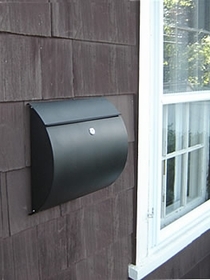 Question: Can the post mount mailbox be side mounted (versus end mounted as shown)? 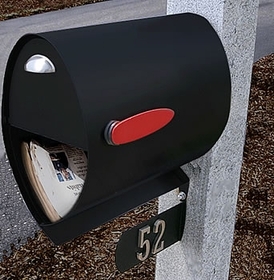 Answer: No, this mailbox is intended to be "end mounted" as shown only. Thank you.